I'm going to have a battery mounted remotely in the rear. I estimate the cable run will be 10'-12' depending on where I end up placing the donor electrical distribution box. It was suggested in a build log that welding cable would work well for the long run to the engine compartment, and it looks like a good suggestion. It's available in a wide variety of sizes, gauges and wire strand count. That's great, but I need to know the size required right now, so I can provide routing and mounting for it in the tunnel. Below is a graphic, I think shows some good candidates based on guesswork. I'd love to hear from knowledgeable EE or practical engineer types if there's a little more scientific method of determining which to use. The grapic has the cable diameter in black, number of strands and their gauge in red, and the rated amperage in green. File comment: Modified graphic from a welding cable manufacturer website. I don't know what your current draw will be, but the Canadian electrical code doesn't de-rate a wire's capacity until you get to 100m. I think I used #2 on my car, and it goes from the battery in the passenger foot well to my disconnect on the dash, and then down to the starter. Its probably about 8' of cable. Keep in mind that the current capacities listed will be for continuous duty, and then look at how wimpy the battery cables in most cars are. I bet there aren't many cars that come with anything bigger than a #6 battery cable. First, it doesn't matter where the electrical box is. It matter how far it is to the starter. That wire goes to the starter (or starter solenoid) not the electrical distribution. For a short term duration (starting) you are not too worried about the "current rating" of the wire. That current rating is based on continuous operation and depends on the type of insulation and the expected ambient temperature. I think the main concern would be voltage drop in the wire. The starter draws a lot of current. The allowable voltage drop for an application is an unpublished number. You will have to determine it for yourself. The higher the engine compression, the more current the starter has to work and the more current it draws. The more current it draws, the more voltage drop in the wires. There is no one-size-fits-all. For every 3 wire gauges, the resistance is 1/2. if the resistance is 1/2, then the voltage drop is essentially half. Sorry, there is no one right answer unless that answer is, "It depends". Another alternative to one large wire might be to run 2 parallel wires if that fits best or the wire is less costly. IMO, welding cable may be good ( I don't know the long term oil resistance) , but is more than is needed. it is pricey due to the very flexible insulation ($$) and the high number of fine strands used ($$$). That is necessary for welding applications but not needed for a car application. If you used #1 ga, the voltage drop would be 200 x .0001239 x 10 = 0.248 Volts. Only 1/4 volt lower. if you used #000 wire, the voltage drop is 0.0124 volts. As you can see, it is a function of the law of diminishing returns. The voltage drop reduces the voltage available at the starter by that amount. The lower voltage spins the starter a bit slower. How much is too slow? I don't know. However, I think more important than optimizing the wire gauge to the nth degree is the cranking Amps rating of the battery. it has the biggest impact IMO. Last edited by rx7locost on March 16, 2017, 8:46 am, edited 1 time in total. The lower voltage spins the battery a bit slower. You'd probably want as low a voltage as possible then. I hate it when my battery spins! Ooopps! Sorry about that. Thanks for pointing that out. It has been corrected. when I did the front mount battery in my Fiero I used 2/0 and fed it through some heater hose since it was ran under the car by the heater lines around the gas tank. It works well, but is longer than your run and was for a full size car battery. I am not sure why you are looking to do this, but keep in mind welding cable is not light or cheap. May be better off spending the money you would on the cable on a smaller/lighter battery and keep it close to the engine. As an EE I was going to comment but rx7locost hit every point. The only thing I'll underscore is what's been said already, that in this application, you're only running current through it for a few seconds, so if it gets a little warm, so what. As was said, it's more about voltage drop, which has been covered. KB58, Thanks for the confirmation. While not a papered EE, I have performed the function of EE in many situations. Specifying wire size and insulation type comes 2nd nature to me. The hard part is making a good connection to your lugs on the cable. A true crimp puts enough pressure on the copper to make it flow and establishes a gas tight connection. Otherwise you get oxides which don't conduct well. The voltage drop is a problem if your going to start the car at less than freezing temperatures, so that's a help because I guess you will not do that. At low temperatures the chemistry in the battery runs slower and you may get enough voltage drop to make your coils stop sparking or your ECU to stop ECU'ing. In that case a 1/2 volt drop might matter and it's an issue for ECU design. The big voltage drop is occurring during the early moments the starter is getting the motor to turn over, basically the first compression stroke. It can cause an ECU reset, so they have an OEM spec that says the ECU should be able to ride thru a 50 mSec ( 1/20 second ) voltage dip. I think the starter will pull more than 200 amps for the moment that it is getting started especially with a cold engine, again not really your problem. Your run will be 3 or 4 times as far as OEM, so for the same drop you will need at least 3 gauges maybe 6 bigger. For a battery get the kind that uses a fiberglass matt to space the plates. They work really well and survive being discharged while the car is sitting much better than the normal types. I've been researching, locating and ordering all the various components I need to get the tunnel and its infrastructure completed: brake lines, attachment hardware; fuel lines; insulation; adhesives; foil tape; yada, yada, yada. I think I've spent 10-11 hours a day on the computer for 3 days in a row now and my brain's in a complete twist. The only things I don't have now are the battery cable and the cable mounting hardware. Chuck, you provided excellent information, and I appreciate it. Tomorrow, when I'm fresh, I'll really try to understand it all. Thanks also to everyone who added to the conversation. Locating the battery to the rear is a packaging necessity and a weight distribution benefit, so those are the reasons for my doing it. My battery is a brand new one I bought for the donor, just months before I disassembled it. I've charged it up a time or two in the garage, where it sits on wood blocks, and I expect it will be good. I don't know how it will perform at that distance, but I'm going to try it. I should provide space for a larger battery, just in case it proves inadequate at that distance. But, that's day-after-tomorrow's problem, so I'm just going to veg out tonight. A true crimp puts enough pressure on the copper to make it flow and establishes a gas tight connection. Otherwise you get oxides which don't conduct well. What's the preferred method for making cable/lug connections? Should they be crimped only? Soldered? Crimped then soldered? Brazed? Crimped then Brazed? Something else? The answer is probably in one of the Carroll Smith books but I don't have them close at hand at the moment so I'll ask you. https://www.summitracing.com/search/part-type/battery-cables?sortby=Default&sortorder=Ascending&keyword=battery%20cables&kr=battery%20cables Looks like the cables they sell at Summit are mostly 1, 1/0 and 2. Mostly... Those size wires should work for you, based on that reference. Speaking of SLowe's, I got the connectors for my battery cable ends at one of those home store places. They're meant to be ground lugs or some such thing. There's a big square end that the bare end of the wire fits into and a set screw that clamps down on it. 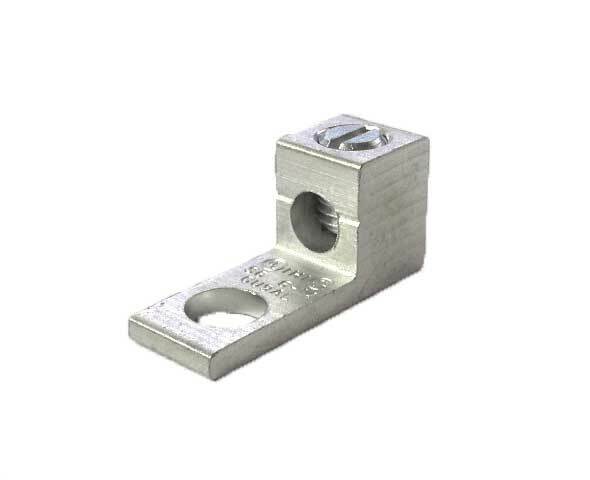 Extending out for the square end is a tab with a hole in it for attaching to whatever point it goes to. I'll try to get a picture of that rig tomorrow and pass it along. OK, all the smart kids have already answered your questions, but I wanted to chip in my .02... I feel better now! Like this JD? We use these at work, but I never thought to use them one my car. I used some crappy crimp on ones instead. Can't disagree with anything here. All good advice. Yes! That is per-zackly what I'm talkin' about! I put some red lock-tite on the threads and cranked that baby down on the wire. I had to enlarge the hole in the lug a bit for some of the attachments (like the starter relay). They've worked fine so far.